To wash or not to wash, that is the question! I’m finally done digging out from Jonah! 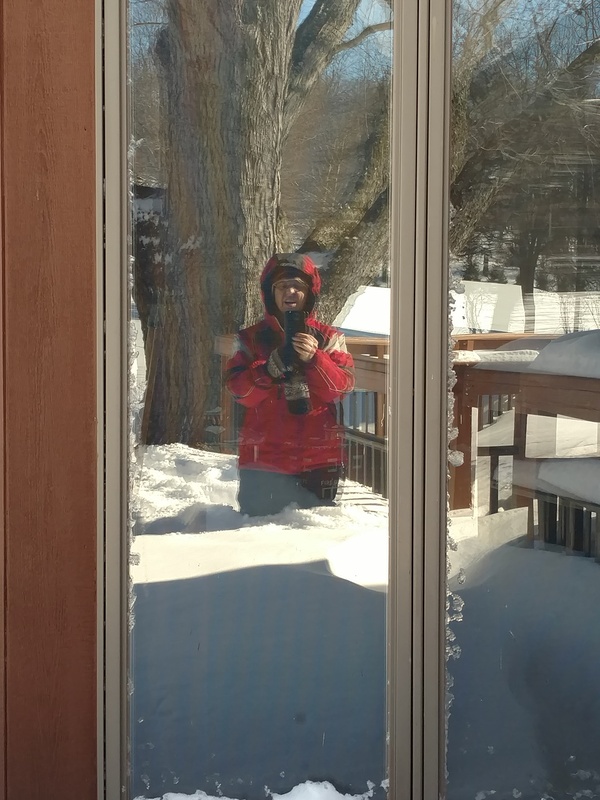 That’s me thigh high in snow taking a reflection selfie by our deck on Sunday. 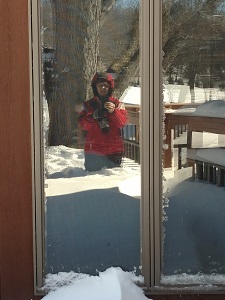 I was trying to beat a path to the back door to free it from the snow 28″ of snow we got! We had drifts against the house and doors of up to 5 feet! That was our only snow so far this winter. Of course I was scheduled to teach a class that day. Fortunately, we already had a snow make-update set up for this weekend. I’m hoping that we’re done with snow now! OK, so let’s get started with Tips & Techniques from my College of Continuous Quilting Improvement (CCQI) Workshop! Quilters seem to be divided into 2 camps: “I never pre-wash my fabrics.” and “I always pre-wash my fabrics.” Except for small projects that will be completed quickly, do not require precision or that I know will never be washed, I belong squarely in the “pre-wash” camp for a couple of reasons. Fabric is dirty and can be smelly. The mills where the fabric is produced are not “clean-room” environments. There’s no telling what’s been roaming around those factories. If you have ever worked in a fabric store, at the end of the day you’ll notice that your hands feel dirty and might smell a little funny. This is from all of the different chemicals and dyes used to make the fabric. Do you really want to be spending a lot of time handling fabric like that? I don’t! Fabric is often over-dyed and can bleed when wet. I’m sure you’ve heard at least one story where a quilter cried after spending countless hours on a quilt only to have the dark colored fabric bleed all over the lighter colored fabrics. Maybe it has happened to you? Of course, you can always throw one of those dye catchers in with the quilt and say a little prayer. But wouldn’t you rather know that the possibility exists or you had the chance to minimize the risk before it had a chance to ruin your creation? I would! Some fabrics come from the mill with a lot of sizing to give it that crisp feel, others not so much. Some fabrics just didn’t make it onto the bolt quite right. Have you ever tried to iron out a wrinkle or fold in the fabric that came as a result from improper rolling on the bolt? It’s next to impossible. Call me picky, but I want all of my fabrics to behave the same way and be as smooth as possible. The only way I have found to even out the playing field is to start from scratch by washing it and applying my own sizing/starch. So those are the reasons why I pre-wash my fabric. Sure, it means I probably can’t start cutting into the fabric the minute I get home from my local quilt shop. But I’m OK with that. Once my fabrics are washed, it’s time to get out the starch! I’ll talk about that next time!